Memorial Hall, immediately north of Harvard Yard in Cambridge, Massachusetts, is an imposing High Victorian Gothic building honor­ing the sacrifices made by Harvard men in defense of the Union during the American Civil War‍—‌"a symbol of Boston's commitment to the Unionist cause and the abolitionist movement in America." Memorial Hall is, in the opinion of the President and Fellows, the most valuable gift the Uni­ver­si­ty has ever received, with respect alike to cost, daily usefulness, and moral significance. Between 1865 and 1868 an alumni "Committee of Fifty" raised $370,000 (equal to one-twelfth of Harvard's entire endowment at the time) toward a new building in memory of Harvard men who had fought for the Union in the American Civil War, particularly the 136 dead‍—‌a "Hall of Alumni in which students and graduates might be inspired by the pictured and sculpted presence of her founders, benefactors, faculty, presidents, and most distinguished sons." When, about the same time, a $40,000 bequest was received from Charles Sanders (class of 1802) for "a hall or theatre to be used on [any] public occasion connected with the College, whether literary or festive", a vision was formed of a single building containing a large theater as well as a large open hall, and thus meeting both goals. In May 1878 the Committee of Fifty notified the President and Fellows that the project was complete and the premises ready for formal transfer to the university. On July 8 the President and Fellows unanimously voted to "accept with profound gratitude this splendid and precious gift." The building's High Victorian Gothic design, by alumni William Robert Ware and Henry Van Brunt, was selected in a blind competition. A 1907 publication gives dimensions of 305 by 113 feet, with a height of 190 feet at the tower; a 2012 source gave a height of 195 feet, making it the ninth-tallest building in Cambridge at that time. Its 1970 National Historic Landmark designation recognized it one of the nation's most dramatic examples of High Victorian Gothic architecture. What was originally known as Alumni Hall‍—‌nine thousand square feet shaped by massive wooden trusses, walnut paneling, and a blue, stenciled ceiling‍—‌was dedicated in 1874. Originally intended for formal occasions such as alumni dinners, it was almost immediately converted to a dining commons, and was for fifty years the college's main dining hall (charging, in 1884, $3.97 for a month's meals). In 1893 the Harvard Graduates Magazine described "the throngs of men who, at one o'clock, are to be seen racing across the yard from Harvard, Boylston, and Sever [Halls], striving to reach [Memorial] Hall ahead of slower competitors for vacant seats at the overtaxed tables". But "as the center of University life moved south toward the Charles, [the dining commons] became less popular and closed in 1925"  (see Harvard College § House system) after which Alumni Hall saw mostly light use, typically as a venue for dances, banquets, examinations, and the like. In 1934 The New York Times reported that Harvard officials had "at last found a use for Memorial Hall" by siting a rifle range in the basement. During World War II the Crimson reported that "the Great Hall" was being used "in winter-time for the 6 o'clock in the morning calisthenics of the [military] Chaplain's School" (though without explaining why Harvard Divinity students had been singled out for this treatment) and intimated that Stevens Laboratory, in the basement, "is doing secret work in acoustics." After extensive renovations, in 1996 the space was renamed Annenberg Hall and supplanted, as the freshmen dining hall, the Harvard Union, which had performed that function during most of the intervening time. Drawing by F.G. Attwood for the Harvard Lampoon (1877): "Manners And Customs Of Ye Harvard Studente: Ye Memorial Hall"
One of twenty-eight marble tablets honor­ing Harvard's Union dead. This one lists Robert Gould Shaw, Class of 1860.
tablets to one after another of the many who thus died‍—‌a thrilling list. One sees such old New England names as Peabody, Wadsworth, and Bowditch; one sees the name of Fletcher Webster; one sees that an Edward Revere died at Antietam and a Paul Revere at Gettysburg. Sanders Theatre (substantially completed in 1875, but first used for Harvard's 1876 commencement) was inspired by Christopher Wren's Sheldonian Theatre. Renowned for its acoustics, and with 1166 seats Harvard's largest meeting place,[clarification needed] Sanders is in great demand for lectures, concerts, ceremonies and conferences. Winston Churchill, Theodore Roosevelt, Martin Luther King, Jr, and Mikhail Gorbachev have spoken there. Sanders features John La Farge's stained-glass window Athena Tying a Mourning Fillet; statues of James Otis (by Thomas Crawford) and Josiah Quincy III (by William Wetmore Story) flank the stage. The exterior gables display busts of great orators: Demosthenes, Cicero, John Chrysostom, Jacques-Bénigne Bossuet, William Pitt, 1st Earl of Chatham, Edmund Burke, and Daniel Webster. Sanders Theatre contributed in an unusual way to the early work of Wallace Sabine, considered the founder of architectural acoustics. In 1895, tasked with improving the dismal acoustical performance of the Fogg Museum's lecture hall, Sabine carried out a series of nocturnal experiments there, using hundreds of seat cushions borrowed from nearby Sanders as sound-absorbent material‍—‌each night's work being limited by the requirement that the cushions be back in Sanders in time for morning lectures there. The scientific unit of sound absorption, the sabin, is very close to the absorption provided by one Sanders Theatre cushion. Twenty-two stained-glass windows, installed between 1879 and 1902, include several by John La Farge, Louis Comfort Tiffany Studios, Donald MacDonald, Sarah Wyman Whitman, and Charles Mills. The central tower was nearly complete by 1876, but criticism convinced Van Brunt and Ware to revise it in 1877. In 1897 was added what a 1905 guidebook described as "an enormous [four-faced clock which] detonates the hours in a manner which is by no means conducive to the sleep of the just and the rest of the weary", and which Kenneth John Conant termed "railroad Gothic". In 1932 the clock's driving works, and the associated 155-pound (70 kg) bell-clapper, were somehow lowered 115 feet (35 m) to the ground without attracting attention; visiting Yale students were suspected but the clapper was never found. Three years later the disappearance of the replacement clapper, under similar circumstances, was rumored to be Yale's revenge for the theft of its mascot, Handsome Dan. The John Harvard statue stood before the west façade from 1884 to 1924. The John Harvard statue was originally (1884) installed before Memorial Hall's west façade, but in 1924 it was moved to its current location on the west side of University Hall. Memorial Hall being still, at the time, the college dining hall, a Harvard Lampoon cartoon showed "John Harvard" dismounting his plinth, chair in tow, and holding his nose because he "couldn't stand the smell of 'Mem' any longer". ^ "During the nineteenth century, Kirkland street went by the name of 'Professors' Row' ... On the south side of the street was the college playground, the 'Delta,' so called from its shape being that of the Greek letter, bounded by Kirkland, Cambridge and Quincy streets. Here the football games took place." To take over the Delta's prior role, Jarvis Field was purchased‍—‌about five acres, or 2 ha, bounded by Massachusetts Avenue, Oxford Street, Everett Street, and now-defunct Jarvis Street (and now occupied mainly by housing for graduate students). In 1874, Harvard played McGill there in the first rugby-style football game played in the United States. In the 1960s Kirkland Street was truncated in conjunction with construction of the Science Center, so that the Delta no longer exists as an isolated city block. ^ King, M. (1884). Harvard and Its Surroundings. Moses King. p. 41. Retrieved 2017-01-29. ^ American Architect and Architecture. 25. American Architect. 1889. Retrieved 2017-01-29. ^ The Dublin University Magazine: A Literary and Political Journal. 92. W. Curry, jun., and Company. 1878. p. 503. Retrieved 2017-01-29. ^ Shand-Tucci, D.; Cheek, R. (2001). Harvard University: An Architectural Tour. Princeton Architectural Press. p. 158. ISBN 9781568982809. Retrieved 2017-01-29. ^ a b c d e f g "History of Memorial Hall". Fas.harvard.edu. Retrieved 2015-03-30. ^ Harvard University (1949). "Memorial Hall". Education, bricks and mortar: Harvard buildings and their contribution to the advancement of learning. p. 81. ^ a b c Hannah Winthrop Chapter, D.A.R. (1907). Historic Guide to Cambridge (Second ed.). p. 163. ^ Thomas Coffin Amory (1871). Old Cambridge and New. James R. Osgood & Company. p. 16. ^ "No Christian End!" (PDF). The Journey to Camp: The Origins of American Football to 1889. Professional Football Researchers Association. Retrieved 2010-01-26. ^ "Cambridge's tallest buildings - Top 20". Emporis.com. Retrieved 2012-11-14. ^ "NHL nomination for Memorial Hall, Harvard University". National Park Service. Retrieved 2015-02-27. ^ "December 2011 meeting notes | Boston Society of Architects". Architects.org. 2011-03-09. Retrieved 2012-11-05. ^ "Fact and Rumor", Harvard Crimson, November 15, 1884. ^ a b Services Use Mem Hall for Cal, Drill, Classes, Movies: 70 Year Old Building Was College Center Harvard Crimson. August 24, 1943. Retrieved 2012-11-10. ^ a b Shackleton, Robert. The Book of Boston (1916), p. 235. ^ "Description of Exterior of Sanders Theatre from the Office for the Arts at Harvard". fas.harvard.edu. Retrieved 2017-01-29. ^ Smith, D.L. (2011). Environmental Issues for Architecture. Wiley. ISBN 9780470644355. Retrieved 2017-01-29. ^ Christopher Reed, War and Peace: A stained-glass window in Harvard’s Memorial Hall Harvard Magazine, January–February 2010. ^ a b "John Harvard's Journal. Restored". Harvard Magazine. March–April 1999. ^ Stearns, Frank Preston (1905). Cambridge Sketches. J. B. Lippincott. p. 39. ^ "The College Pump". Harvard Magazine. Vol. 98 no. 5. May–June 1996. ^ "Apted's Work in Codfish Tangle Brings Promotion". The Harvard Crimson. May 1, 1933. ^ "Presenting the Wide World in Pictures. A Mystery in the Harvard Yard" (PDF). Rome Daily Sentinel. Rome, New York. ^ Teslik, Lee Hudson (March–April 2004). "The Undergraduate. The Prankster's Secret". The Harvard Magazine. 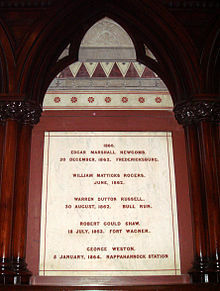 Wikimedia Commons has media related to Memorial Hall, Harvard University. Harvard: America's Great University Now Leads the World Life, vol. 10, no. 18 (May 5, 1941), cover, pp. 22, 89–99. Photo caption, p. 95: "In Memorial Hall, a huge Victorian Gothic barn dedicated to Harvard's Civil War dead, the college's Naval R.O.T.C. unit drills." This page was last edited on 4 April 2019, at 23:28 (UTC).